Ms. Bobblesbee is known as the MacGyver of the great outdoors for her uncanny ability to extricate herself from precarious and dangerous situations. For Agatha, a pencil isn’t simply a pencil. It is a climbing wedge, a tent stake and a compass needle. Ms. Bobblesbee resides in the sunny countryside, where she can be found trekking through the woodlands in search of the elusive flying bear. 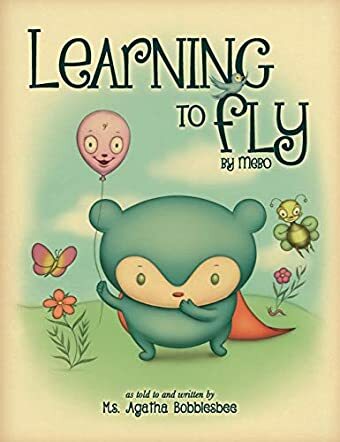 Learning to Fly: By Mebo by Agatha Bobblesbee is the adorable story of feisty little Mebo, a blue panda who is born in a zoo. Mebo’s adventurous streak makes him travel throughout the world where he meets Speck the dog and Zeppo the balloon, who accompany Mebo in his traveling adventures. Mebo can jump over fences like dogs, but he wants to fly like butterflies, soar like birds, and spin like dragonflies. He tries to fly but is unable to do it. Mebo watches the moon at night as she winks at him from the starry sky. Will Mebo be able to fly and meet the moon?